The electricity you provide powers thousands of homes. With all of those families depending on your service, you’re bound to get hundreds of inbound dialers every day. That means you need the best call center software out there. Look no further than Nectar Desk. 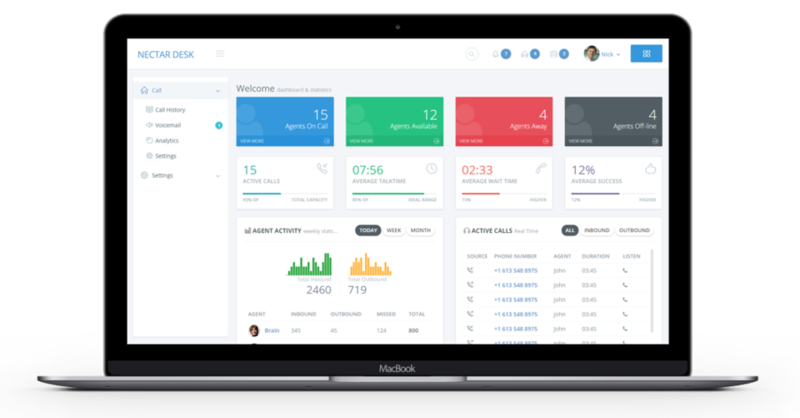 Nectar Desk provides all the best call center management features that are needed to run a great call center. With the help of a world class automatic call distribution system and interactive voice response (IVR) system, Nectar Desk will make your customer experience easy and simple. Call monitoring and recording is also made easier with Nectar Desk’s computer telephony integration technology. When you need to retrieve call detail records from past calls, Nectar Desk makes it convenient and straightforward. Our analytics technology will also provide you with the tools to plan against peak call times so that you are staffed to fulfill demand at any time. Now with Nectar Desk, you can prevent yourself from being caught off guard by unexpected high call volumes. Nectar Desk is the answer for your electricity provider’s call center. We fulfill our mission by delivering the most simple, intelligent Cloud-Based Phone System Solution in the world. There is unlimited value in knowing every aspect of your call performance. We show you data that lets you get to know your call stats like the back of your hand. You don’t need to pay extra to be treated like royalty. Our support ninjas team is available for you any moment you may need them.